Car Servicing and Mechanical Repairs that come to you! 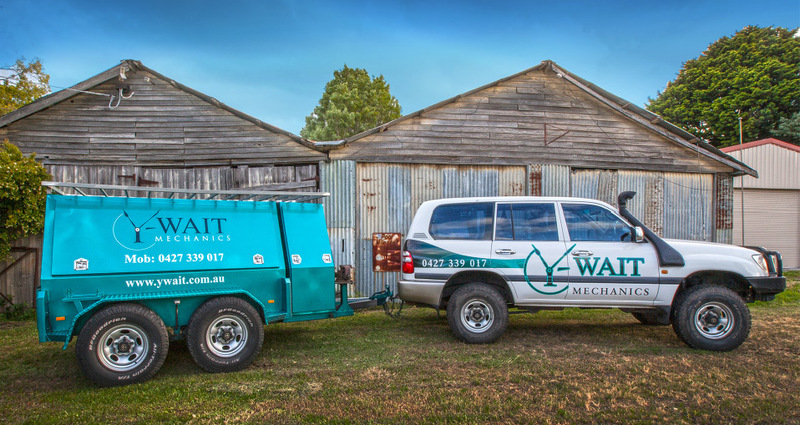 Y-Wait Mechanics is a Victorian based business covering large areas in and around Ballarat. We strive to be the first choice mobile mechanic to individuals and businesses by providing outstanding workmanship, professionalism, quality service and affordable prices. We will service or repair your vehicle in a clean professional manner all fully guaranteed. We are fully qualified and equipped to perform any car repair or car service, 4WD servicing and supply & fitting of 4WD accessories. We come to you at a time and a place of convenience. No waiting when dropping off your car, no organizing lifts or being without your car all day. Give us a call and we will meet you 7 days a week. Whether you drive a brand new car or a 40 year old classic, we can service and/or repair it. We use quality parts which meet or exceed new car specifications and will not affect your new car warranty. New or used car franchise dealers do not have a monopoly on “Log Book” Servicing. Nor can they state that your warranty will be void if you have the vehicle serviced by someone else. However the owner has the responsibility to ensure that the vehicle is serviced properly at the designated log book intervals by qualified technicians and that the service work carried out meets manufacturers’ specifications. We service and repair all makes and models and most importantly we can repair or service your car any day of the week. As the name says, ‘why wait’. Warren has been servicing the Civil Services fleet of utes for the last 1 1/2 years. In this time Warren has exceeded our expectations by going out of his way to offer us the best possible service. Not only do we have the flexibility of getting our utes serviced on premises but because of continuous long distance travelling throughout Victoria our utes are not often within close proximity to our premises so Warren is willing to service these utes on the weekends to ensure that our fleet is ready to go at all times during the working week. Warren was able to match and in some cases better the servicing prices around the local area. We have no hesitation in recommending Warren from Y-Wait Mechanics to anyone and hope that we can continue our working relationship for many to come.